Big history weaves evidence and insights from many scientific and historical disciplines across 13.7 billion years into a single, cohesive story. The course highlights common themes and patterns that can help us better understand people, civilizations, and the world we live in. The concept arose from a desire to go beyond specialized and self-contained fields of study to grasp history as a whole. Big history explores how we are connected to everything around us. It provides a foundation for thinking about the future and the changes that are reshaping our world. What is the Big History Project? The Big History Project LLC (BHP) is an organization focused on bringing big history to life for high school students…. BHP is sponsored by Bill Gates, separately from his work with the Bill & Melinda Gates Foundation. All of the content is available online. A completely web-based model ensures the content is up-to-date, relieves schools of the need for costly textbooks, and also helps teachers engage students by providing approachable, media-rich materials that can be used in different ways. Pilot participants and anyone who requests a username and password is able to access the course. Students and teachers are issued a personal login to gain access to a specialized site that houses all courseware and content. It is up to each individual teacher to determine optimal approach to using the site. For example, in-class time may focus on group projects or discussion, with students absorbing online content for homework, or the site may be used as a core element of the in-class experience. How is my school supported and what does it cost? Most importantly, a spirit of partnership imbues everything we do. Our singular goal is to get big history in the hands of educators and students, we promise to listen and collaborate accordingly. In return, we expect schools to collaborate and communicate with us to improve the program. Specifically, this means: incorporating BHP courseware, content and assessments into the lesson plan, participating in professional development activities, and regularly updating the project team about what is happening in the classroom. Big history is broken down into 2 sections and a total of 10 units spanning 13.7 billion years. Within each unit there are between 20 – 30 specific content modules covering specific issues, topics, projects and assessments. Section 1: Formations and early life: Theories and evidence of origins of the Universe, planet formation, elements, and life. Unit 2: The Big Bang? Section 2: Humans: The development of humans, civilizations, and key milestones in our progress. 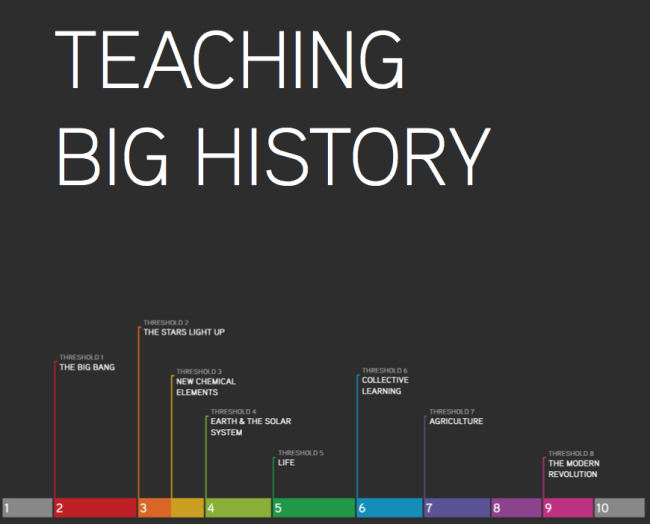 This project is designed to get teachers and schools interested in using the Big History curriculum to teach at their schools. But the project has indicated that they may offer “an open, public version of the course in September.” They have advise people, like you, who might be interested in taking such a course to follow them on Facebook for updates.